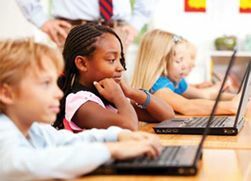 Technology may seem difficult to implement for very young learners, but there are user-friendly tools that can enhance English lessons. ¦ VOKI is certainly the first tool that you can use with your young learners. Create an animated and speaking avatar with your own voice or by using your text-to speech application. You can fully customize your character, which moves its head and eyes with the movement of the mouse. Kids love this. ¦ VOICETHREAD is the best digital storytelling tool to use with students of any age. You create a digital presentation and let the kids comment on each picture by recording their voices, writing a text, or filming themselves. It’s a great way to retell the stories, create an engaging speaking activity for the kids, and collaborate with other classes all over the world. ¦ EDUGLOSGTER is an online, interactive poster in which you can embed text, video, audio, animated graphics, pictures, and music. Kids love watching or hearing themselves in a creative, animated, and colorful outlet. ¦ BUBBLEJOY lets you create a video greeting card using your own video. You can choose from among fun card designs that will fit your topic. ¦ MOSHIMONSTER is a cute game to play with very young learners. They adapt their own monster, give it a name, and design its color scheme. The monster makes new friends, chats with others, plays games, and develops a personality. If your kids like Moshi Monsters, they should also try Shidonni, where they can create their own animals and watch them come alive. ¦ TALKINGPETS is another favorite of mine to use with young learners. This site has animal characters and is similar to Voki, and you can use only the textto- speech application. ¦ KERPOOF is also suitable for use with young and very young learners. It’s a creative way to tell stories and create animated movies and greeting cards. ¦ STORYBIRD allows children to create stories from scratch using their own text and pictures. It’s also collaborative, so children can start a story at home and finish it when they come to school. ¦ FOTOBABBLE is a way to make photos talk. Just upload your pictures, record your voice, and publish. It’s another way to motivate children to speak. Read more from T&L adviser Ozge Karaoglu at techlearning.com.